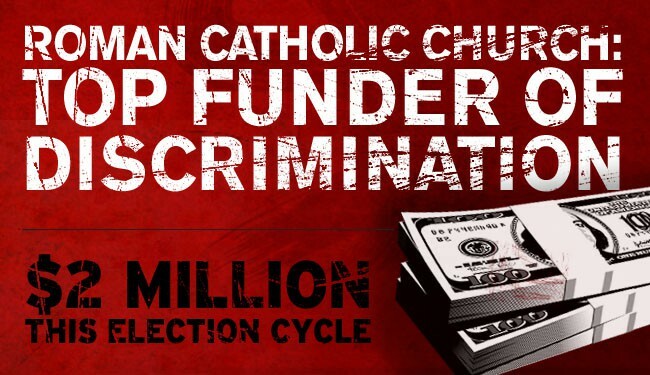 With the dust settling from this month’s national elections, Human Rights Campaign has had an opportunity to look over donations to anti-gay marriage initiatives and found that the Roman Catholic Church gave $2 million to the conservative efforts in Minnesota, Maryland, Maine and Washington State. Taking up where the Mormons left off in 2008, the Catholic Church – and its affiliate, the Knights of Columbus – have made considerable investments in the marriage fights in Minnesota, Maryland, Washington State and Maine this election cycle – spending nearly $2 million. In addition, a close ally of the Church and past co-conspirator, the National Organization for Marriage, spent more than $5.2 million this cycle. Final campaign figures for Maryland and Maine will be available by the end of the month. Marriage equality opponents across the four states raised $11.3 million. The Catholic Church’s contributions make up 17 percent of that total figure. When you add in the contributions of Church ally NOM, the reality of the coordinated effort becomes clear: the Catholic Church, the Knights of Columbus and NOM are responsible for funding nearly 65 percent of all anti-equality efforts in Minnesota, Maryland, Washington State and Maine. All this despite poll numbers showing that almost 60% of American Catholics support marriage equality and with poverty, something the Catholic Church claims to oppose, steadily climbing, particularly among Latinos, a largely Catholic demographic. #priorities.